One day, when I was searching dog training school web sites, I found Doggy Do’s & Don’ts, so I called Olive to set a session for my dogs. After the training session, my dogs have become better behaved. The session that Olive gave to my dogs is pack leadership. Now I feel like not only my dogs but also myself are trained by the trainer. 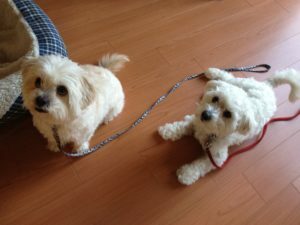 She explained to me about dogs’ thinking and behavior, so I understood the way I communicated with my dogs was wrong. A dog is born to be a leader or follower. If I want to take control of them, I must be a leader; otherwise they will take charge of everything. That explained why they were the barkers, because they wanted to take lead. There are a lot of details which I won’t mention here. But I would like to say; this training work on my dogs. Now my dogs’ behavior is getting better and better, I will keep practicing everything I learned from Olive.